Purpose: Therapy with [177Lu-DOTA,Tyr3]octreotate is effective in patients with grade I/II metastasized and/or inoperable bronchial neuroendocrine tumour (NET) or gastroenteropancreatic NET (GEP-NET). 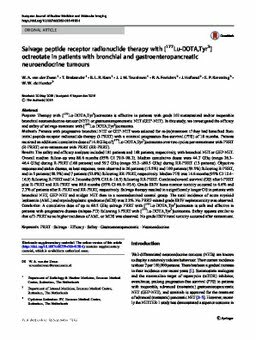 In this study, we investigated the efficacy and safety of salvage treatment with [177Lu-DOTA,Tyr3]octreotate. Methods: Patients with progressive bronchial NET or GEP-NET were selected for re-(re)treatment if they had benefited from initial peptide receptor radionuclide therapy (I-PRRT) with a minimal progression-free survival (PFS) of 18 months. Patients received an additional cumulative dose of 14.8 GBq of [177Lu-DOTA,Tyr3]octreotate over two cycles per retreatment with PRRT (R-PRRT) or re-retreatment with PRRT (RR-PRRT). Results: The safety and efficacy analyses included 181 patients and 168 patients, respectively, with bronchial NET or GEP-NET. Overall median follow-up was 88.6 months (95% CI 79.0–98.2). Median cumulative doses were 44.7 GBq (range 26.3–46.4 GBq) during R-PRRT (168 patients) and 59.7 GBq (range 55.2–≤60.5 GBq) during RR-PRRT (13 patients). Objective response and stable disease, as best response, were observed in 26 patients (15.5%) and 100 patients (59.5%) following R-PRRT, and in 5 patients (38.5%) and 7 patients (53.8%) following RR-PRRT, respectively. Median PFS was 14.6 months (95% CI 12.4–16.9) following R-PRRT and 14.2 months (95% CI 9.8–18.5) following RR-PRRT. Combined overall survival (OS) after I-PRRT plus R-PRRT and RR-PRRT was 80.8 months (95% CI 66.0–95.6). Grade III/IV bone marrow toxicity occurred in 6.6% and 7.7% of patients after R-PRRT and RR-PRRT, respectively. Salvage therapy resulted in a significantly longer OS in patients with bronchial NET, GEP-NET and midgut NET than in a nonrandomized control group. The total incidence of acute myeloid leukaemia (AML) and myelodysplastic syndrome (MDS) was 2.2%. No PRRT-related grade III/IV nephrotoxicity was observed. Conclusion: A cumulative dose of up to 60.5 GBq salvage PRRT with [177Lu-DOTA,Tyr3]octreotate is safe and effective in patients with progressive disease (relapse-PD) following I-PRRT with [177Lu-DOTA,Tyr3]octreotate. Safety appears similar to that of I-PRRT as no higher incidence of AML or MDS was observed. No grade III/IV renal toxicity occurred after retreatment.